Last week two of my cousins, Anna and Allie, came over for dinner. Before the girls arrived, my grandmother spilled the beans that Anna had just received her Masters diploma in the mail. (Anna is sorta brilliant and is in a PhD program at Johns Hopkins.) So I know that a Masters is only a stepping stone on the way to a PhD, but... don't you think getting a diploma in the mail is a rather unceremonious way of finding out you have achieved a major milestone in life? Well, we thought so. So... we baked a cake! And not just any cake. This cake was on the front cover of September's Southern Living Magazine, and I happen to have been dreaming of a bite of that cake for weeks. Can you imagine why? 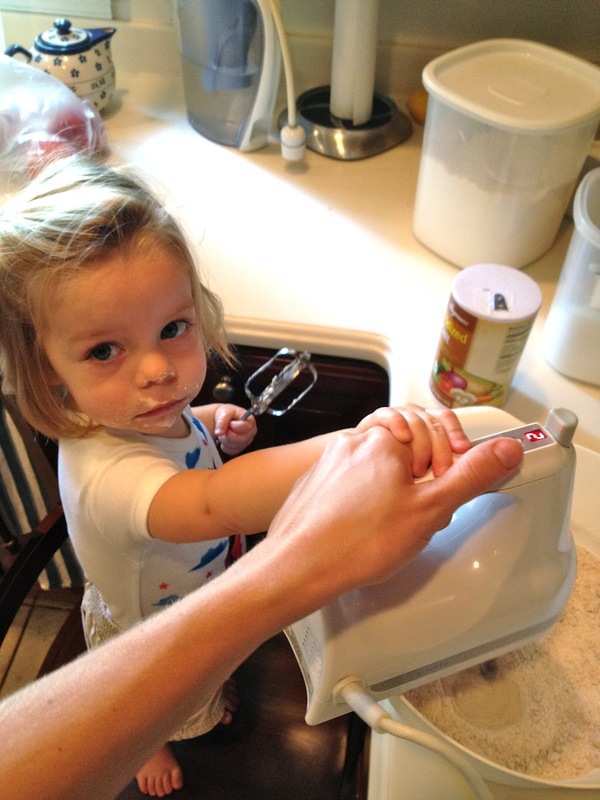 Lena "helped" me in the kitchen (and might have enjoyed a little batter along the way too!). 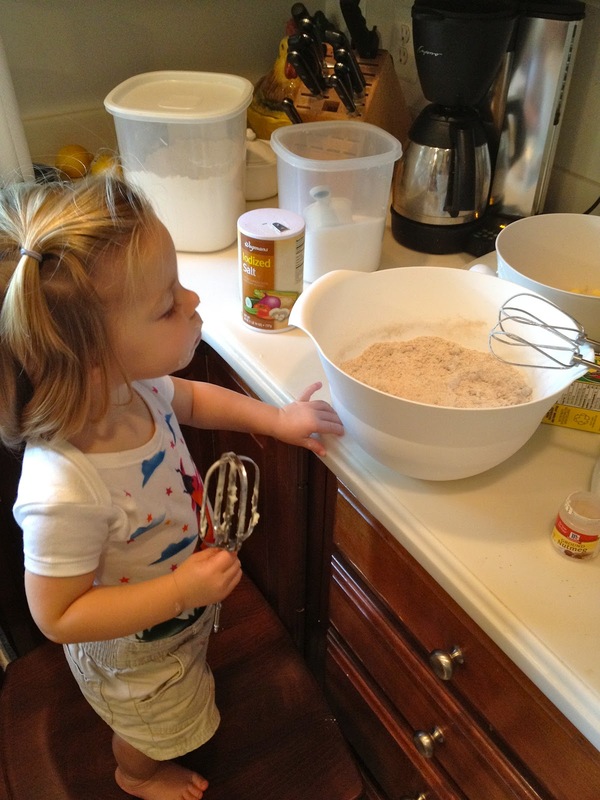 Make baking a fun way to spend the day! In the end, we ate the cake. 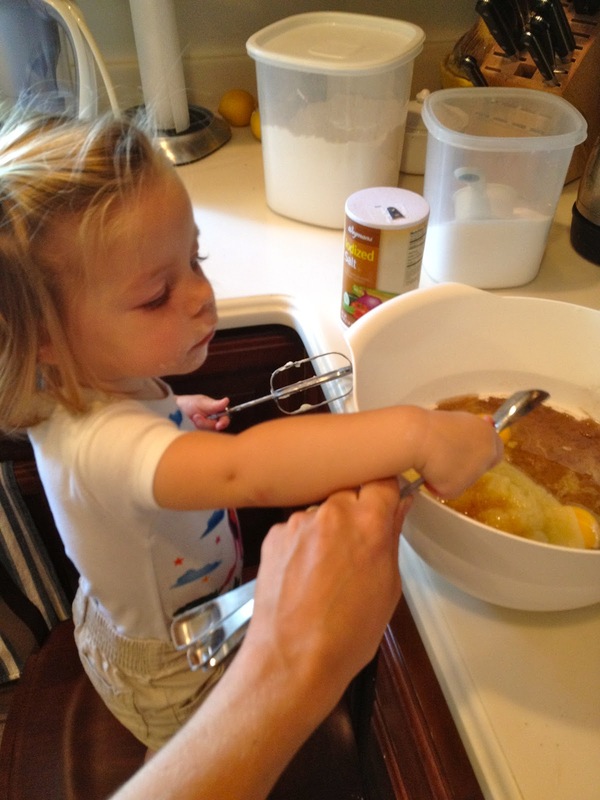 Here's the recipe so you too can bake! Preheat oven to 350º. Bake pecans in a shallow pan 8 to 10 minutes or until toasted and fragrant, stirring halfway through. Stir together 3 cups flour and next 7 ingredients in a large bowl; stir in eggs and next 3 ingredients, stirring just until dry ingredients are moistened. Stir in apples and pecans. I made this while my hubby was away for just that reason... he can't have dairy! YOUR cake looks just as pretty as the magazine cover! Thanks so much, Stacie. I couldn't believe it turned out so well... but the finishing of the cake is pretty fool-proof. Looks so good! 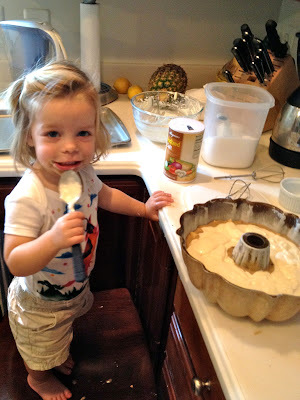 I love how she has so much batter on her face :) such a great helper! Haha, she tries. We're working on the patience aspect! That cake looks divine! You could be on the cover of the magazine. Already ate it all. :-( I can make you another one! Yummm!! You are definitely having fun back home! That cake looks so very good, not something I should be thinking about at 8pm! your family is adorable, love your blog! new follower! Thank you, Joanna! Love your blog and your darling daughter. Southern Living Cover Cakes are something else, aren't they? We make up special occasions just to bake them! Enjoy your visit! I didn't know these cakes were a "thing," but now I might be looking for more special occasions in order to make them myself!